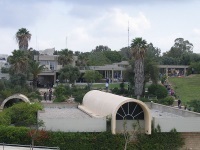 The Eretz Israel Museum's unique layout and character make it more like a park than a standalone establishment. It is clustered around the ancient mound of the Tel Kasile, where ongoing archaeological excavations are in progress. The museum consists of various pavilions, each displaying different cultural artefacts and collections. Visitors can purchase a map to help them navigate through this fascinating campus, which covers 3,000 years of history, culture and art relating to Israel. The permanent exhibits include displays on ethnography and folklore, ceramics, copper, coins, crafts, agriculture, domestic life, and many aspects of social and political history. The exhibitions are not all equally impressive and some are better organised than others. Still, there are plenty of treasures to be discovered. There are also temporary exhibitions that change on a regular basis. All exhibits are accessible for the disabled. Photography is permitted but only for private, non-commercial use. Flashes and tripods are not allowed. A special museum shop at the entrance sells clothes, jewellery and all sorts of souvenirs created by talented Israeli designers. Visitors can also buy a wide range of replicas. There is a cafe for refreshments and the Planetarium is right next door - it is possible to buy combined tickets. The air conditioning is a big bonus on hot days. Address: 2 Haim Levanon Street, Ramat Aviv. Admission: Adults: NIS 52. Concessions available.